The complete special package with mona lisa and mangguana, non stop for komodo liveaboard trip, can join anytime you want. Komodo is unique because it offers two totally different marine environments. In the north we experience the warm clear waters that flow from the Flores and Banda seas. Typical of most tropical locations throughout the world. The hard coral reefs are extensive and in pristine condition. To the south, we encounter cooler waters that flow from deep in the Indian Ocean. It is not unusual to encounter whales, whale sharks, mantas, sunfish and other planktonic feeders during dives on the southern sites. Upwelling, caused by deep ocean currents colliding with the continental shelf force an endless supply of planktonic food towards the surface resulting in a rich coral gardens and an exceptional quantity of marine life. The convergence of these two distinct marine ecospheres is responsible for the remarkable diversity found in the waters of Komodo. The waters that surround the island are turbulent and teeming with unparalleled marine life. A marine reserve, it is largely undocumented and remains largely unexplored. During our last voyage to Komodo we discovered several additional world class dive sites which were added to our list of many. The dives boasted schooling hammerheads and large schools of pelagic fish. The park includes 132,000 ha of marine waters. 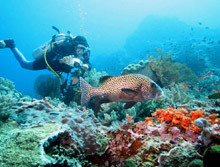 It is one of the richest areas for coral biodiversity in Indonesia and one of the richest fish faunas in the world with an estimated 1000 species. On the reef the vibrant colour quantity of exotic fish life is spectacular. Riding the waterways are endless schools of pelagic fish, manta rays, whales, dolphins, even the occasional dugong. Below, the seabed is covered with a thick carpet of florescent corals and marine invertebrates - an underwater photographers paradise. The seas surrounding the park boil with feeding fish and marine mammals. Strong currents and upwellings transport nutrient-rich waters throughout the Park's marine area and help support a wealth of biodiversity. The number and variety of islands coupled with a wide range of environmental conditions, such as wind exposure, current and wave action, result in a high diversity of coastal and marine habitats, including coral reefs, vertical walls, protected bays, rocky shores, sea grass beds, sandy bays and mangroves. Rapid Ecological Assessments in 1994 and 1995 showed that KNP belongs to the world's richest and most diverse marine environments. 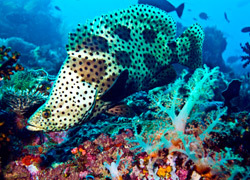 Fish: An estimated 900-1,000 fish species make Komodo National Park one of the world's richest fish habitats. Corals: A total of 253 scleractinian (reef building) coral species from 70 spicies reside within the Park and at nearby Banta Island. The KNP area supports a particularly high abundance of Tubipora musica (organ pipe coral), which make up some of the distinctly pink coral sand beaches. Sponges:An estimated 70 sponge species were recorded in a wide variety of coral reef and near-shore marine habitats. Encrusting sponges made up the vast majority possibly due to the area's strong currents. Algae: KNP supports a high diversity of algae, including economically important species such as gracillaria, gelidium and caulerpa. 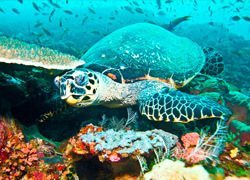 Turtles and Marine mammals: Dolphins, hawksbill turtles (eretmochelys imbricata), and green turtles (chelonia mydas) frequent the Park's waters, and hawksbill turtles nest in the Park. Whales are often sighted, during their regular migration through the area. Dugong are sighted infrequently. Visibility : 10 - 50M year round. Traditionally clearer water on northern sites. Current : Komodo experiences a strong tidal flow. Not all sites are affected by current. Drift diving is excellent, however during spring tides some sites are impossible to dive. Particular attention is placed on diving the correct sites at the most suitable time to ensure optimum conditions, in accordance with the preferences of the group. NIGHT DIVING: The night diving in Komodo is breathtaking. The sheer beauty, colour and diversity of life makes it a must see for all divers. Walls : There are numerous walls to choose from. Both drift and static wall dives are offered. Canyons : Huge chasms drop thousands of meters, fringed by extraordinary coral gardens. Criters : Found in all locations, however we do offer special sites for encountering unusual marine species. Others : Seamounts, fringing reefs, gutters, muck, and sandy locations are also found in the archipelago. 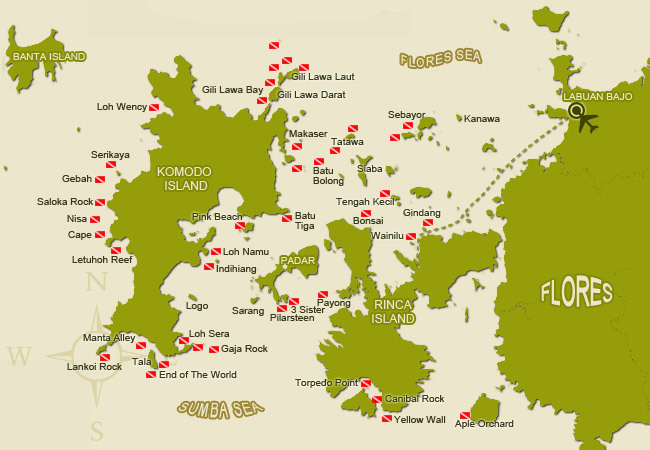 Snorkeling : Komodo has one of the world's most famous snorkel sites(Pink Beach). Also a number of other first class locations..